Last edited by i28; 10-12-2017 at 10:38 PM. Nice. Is that a 8900 series? I love my 8987, it has spoiled me. Yep. It's the 8983 (the two-way adjustable). Can't wait to get it on. The stock shock on the fz-07 definitely affects the fun-factor of the bike after about an hour or two. Last edited by i28; 10-13-2017 at 09:20 PM. Last edited by disciple1972; 10-14-2017 at 12:43 AM. Last edited by disciple1972; 03-18-2018 at 07:00 PM. I received a uniq early Christmas gift from my husband today. He has gifted me his beloved 1199 Panigale which will be my dedicated track bike for 2019. Dustin getting a new bike? He wants the CBR spec'ed out to his liking. He's faster on it anyways so I want to see him continuing to improve. 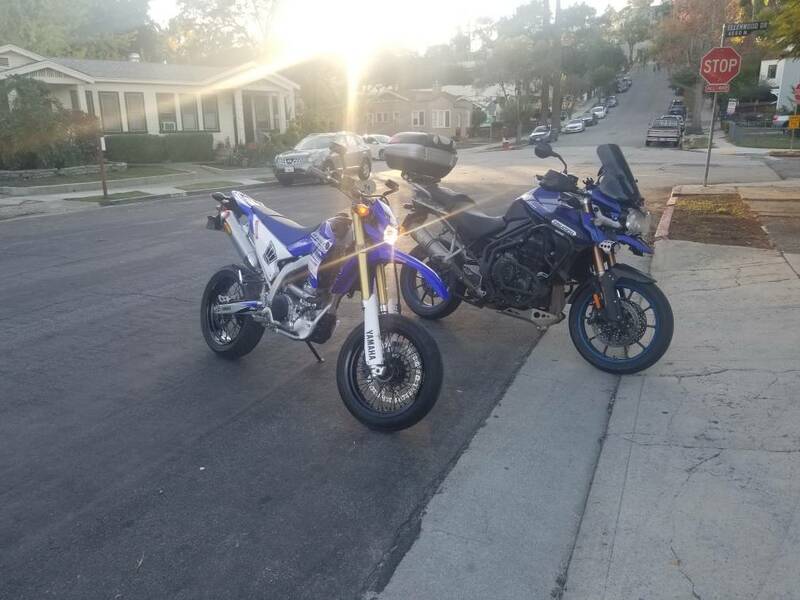 I got myself another blue bike. WR250R with warp 9 wheels AND factory wheels/knobbies.